Are the Mizuno Heist IQ mid cleats really the best out there which gives players full confidence to be quick on their feet to make plays? Are they worth the money? Do they fit well? These questions are answered and more in this in-depth review. 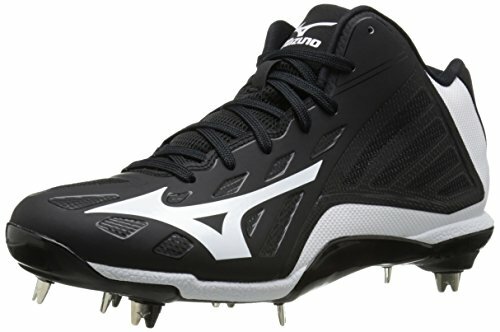 I’ll also talk about the features, benefits and give you my final verdict as to whether I think you should buy the Mizuno Heist IQ mid baseball cleats. Baseball is not all about hitting the ball with the bat. It’s also not all about catching the ball or throwing or pitching the ball with speed and accuracy. Like in many sports that involve a ball and a field, it’s also a lot about running. And for that, you need a great pair of cleats that allows you to get to where you want to be as quickly as possible. For many players, getting a great pair of baseball cleats means lacing up with the Mizuno Heist IQ Mid. Part of the appeal of the Mizuno Heist IQ cleats is that they look great. They make you look good on the baseball diamond. Each pair has white trim and design, but you can get the white to combine with black, grey, navy, red, or royal. You can also get it mainly in white instead, with the trim and design in black. Available sizes range from size 7 to size 16. It’s made with synthetic mesh with synthetic materials on the sole. The anatomical design is specifically aimed in enhancing player performance on the field. The baseball metal spikes have been particularly modified to provide added speed in player movements. The new IQ outsole was made to provide more torsion flexibility and resiliency. You can move every which way and pivot with greater speed for running or for throwing the ball with greater force. The outsole also helps in providing greater traction, while also offering a very light weight to bear. The full length U4ic midsole is made from a new type of midsole material. The midsole offers better cushioning to protect the feet. It also offers superb responsiveness for enhanced acceleration and better changes in direction. These cleats have terrific resiliency which adapts well to various types of movement. The brand new 3-layer “no sew” upper is also a complementary part of the whole. Its light weight provides less of a burden for sprints, greater support to minimize injury, and excellent breathability for greater comfort. The Mizuno Heist IQ Mid baseball cleats offer a cornucopia of athletic benefits that any player on the baseball diamond will truly appreciate. Essentially, the Mizuno Heist IQ provides everything that any player will need on the field. This includes speed, support, and comfort. That means a great deal in baseball. When you’re at bat, you need a comfortable pair of cleats. You need cleats that won’t distract you from the very difficult job of trying to hit a fast-moving ball that changes direction in midair. But with the Mizuno baseball cleats, you have a truly comfy pair of lightweight cleats that won’t give you any trouble. Then you can concentrate on any part of the game at hand. Once you make contact with the baseball, your Mizuno Heist IQ cleats lets you change your orientation quickly to first base, and you also get better acceleration so you can beat the throw. This lets you get on base more often with a bunt or with an infield hit. And what’s more, you can also round the bases more effectively as well. That means you can stretch a double into a triple, or even get an inside the park home run. Once you’re on base, the Mizuno Heist IQ Mid baseball cleats also help you with base stealing and base running. You can get back to first base faster when the pitcher tries to hold you to first. And when the pitcher throws to home base, you can steal second more effectively because you get a burst of speed at once. And then if the next batter gets a hit while you’re on base, you can get to home base much more quickly. You can score while your teammate gets an RBI. Or you can advance another base more quickly, when the next hitter bunts or hits a long fly ball for a sac fly. What it all means is that over the course of a season, you get extra bases and extra scores with your excellent Mizuno Heist IQ. That should improve your team’s record in offensive performance. But you don’t get the benefits of the Mizuno baseball cleats on offense. You also get tremendous performance when you’re fielding. Whether you’re an infielder or out in the outfield, it provides a sure grip on the track so you can react much better to a ball in play. You can make a catch for an out, or field a ball cleanly so you can throw to first base more efficiently. It lets you set up properly for your throw so that you don’t commit a throwing error. You don’t want to give the opposing team an extra base. The cushioning and the comfort provided by the Mizuno Heist IQ Mid must also be mentioned. Your feet are very well protected, so you’re less likely to get injured. That happens more often than you think in baseball. Sudden changes in direction and quick burst of running can punish your feet over the course of the game. Even base running is dangerous when you have the wrong pair of cleats. You can twist your feet when you step on the base wrong as you round the bases. You also need a lot of protection if you step on a fielder’s foot on a base while you’re running at top speed to first base. On offense or defense, the Mizuno Heist IQ Mid is truly excellent. It really does improve your performance tremendously, and what’s more, it also indirectly encourages you to practice more diligently. With these cleats, you no longer have a convenient excuse when you play poorly. You can’t blame these cleats for your inadequacies, and so you really need to practice in order to get better. These cleats are also well-made so they can stand constant use during a long summer baseball season. They can provide many years of service. Add the fact that it looks cool, and what we have here in the Mizuno Heist IQ Mid is a truly smart buy for the smart baseball player.